Dr. Furtado is an associate professor of pathology at the University of Utah School of Medicine. She completed her residency in anatomic and clinical pathology at the University of Utah and ARUP Laboratories, where she was chief resident, and her molecular genetic pathology fellowship at the University of Michigan. 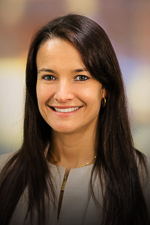 Prior to joining ARUP as a medical director, Dr. Furtado co-founded the Division of Genomic and Molecular Pathology at the University of Chicago, where she worked as an assistant professor of pathology and was the co-director of the University of Chicago Clinical Genomics and Molecular Diagnostics Laboratories. Dr. Furtado’s research interests include genomic diagnostics in solid tumors and molecular diagnostic methods in oncology.